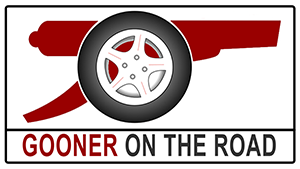 Meet Kurtis Powers, host for the NYC segment of Gooner On The Road and probably better known as co-founder of the NYC Arsenal Supporters club. Kurt is a great friend of mine, and I have to say that if I hadn't met the guy back in 2010 I probably wouldn't have come up with the idea for the Gooner On The Road adventure. My family supported either West Ham or Arsenal, so I had a choice to make and I guess I picked the right one, - there's no going back, that's for sure. Aside from football and the history I guess the global fanbase is second-to-none. The family aspect that it represents to me is unrivalled. I go over to the UK and spend Christmas with friends met through Arsenal, the Gooner Family. Even if we dropped to the 3rd division I'd never stop supporting Arsenal. Losely in the early nineties, but I became serious 1997-1998. Bergkamp, I know everybody else says the same and I'd like to come up with a more creative answer, but for me it's Bergkamp, and a very close second would be Wrighty, who he used to link up with on a regular basis. To me, Bergkamp was like Iceman from topman, slick and cool. Wright was like the Mick Jagger of football, he had that amazing presence. Of course I also appreciate Henry because of the relationship we have through the NYC Arsenal Supporters and that we recognise each other. Jack Wilshere because he grew up through the Arsenal and he went from a boy to a man with the club, he represents the badge. A close second would be Koscielny, he's humble in his approach and he puts his heart (sometimes before his head) into every performance. Of recent, I haven't had as much of a buzz as when Arshavin scored the winner against Barcelona at The Emirates. My second choice would be the Fabregas goal against Tottenham where he went on a run and scored whilst everybody was still celebrating the Van Persie goal and the TV was still catching up. The fact that initially nobody watching the game on TV had any idea what was happening made it all the more entertaining. Q.Where do you watch Arsenal in NYC? Emirates. I have more of a personal connection with The Emirates and I've never seen us lose at The Emirates whilst I've attended in person. Highbury is good but once more people accept the fact that we've moved to The Emirates for a positive reason, the better the Emirates will become. The Arsenalisation has made the Emirates feel like it's becoming our true home, but of course we have no history there yet which is why Highbury will stick out in most Arsenal fan's memories. For me, history will be made at the Emirates. I think we're going to finish 1st or 2nd. I think top 4 will be Arsenal City Liverpool Chelsea, United finishing out the top 4. Aaron Ramsey and Mesut Özil. Ramsey is getting better and better every week, I think he could score 20-25 goals this season. Ozil brings something special that will help the other players around him get better. He's a real positive influence. No, I'm not talking about the Empire State Building, I'm talking about the mighty Arsenal being Top Of The League!!! There aren't many better places to celebrate a return to the top than at the Blind Pig in New York City, home to the NYC Arsenal Supporters. 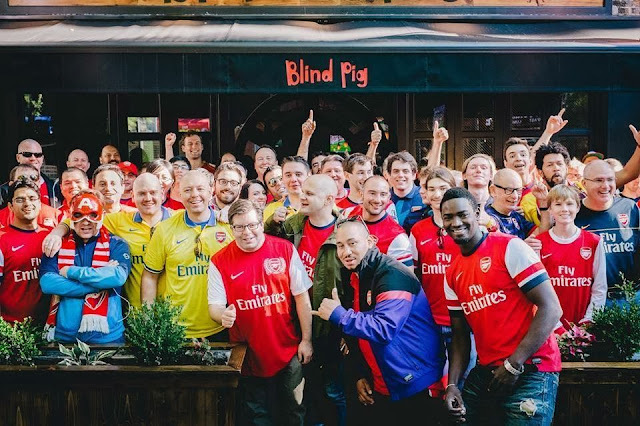 The Blind Pig is arguably the best spot in the whole of North America to watch an Arsenal match, providing of course you're lucky enough to get in; the pub regularly meets capacity to the point where there is now a second pub, O'Hanlon's, just down the road on E 14th Street, so that punters are not left disappointed. Just a typical Satuday outside the Blind Pig in NYC. New York City is one of the cities in the United States. I believe approximately 100 trillion people live in the area, and another billion people visit the city every day, so it's actually of no surprise that there's a considerable number of Arsenal fans residing there and visiting regularly. So with a large turnover of gooners in the area, a 'safe haven' is required to shelter them from the pandemoniac tourists on Times Square and filthy materialists on Fifth Avenue. The Blind Pig is the place they flock to in the hundreds, and as a result the atmosphere is absolutely second-to-none, as you can see from the video below of Mertesacker scoring Arsenal's second goal against The Orcs. The great thing about the Blind Pig is that every game is an event, there are regularly 100+ people there, and even during Champions League ties in the week the pub will fill up. And with every game comes the opportunity to meet new people. I was fortunate enough to meet some notable Gooners at the Blind Pig last weekend, including Olympic Medalist Kelly Sotherton, Olympian Nathan Douglas and last but not least the infamous Arseblog himself. All wonderful people, all Gooners, and all at The Blind Pig to watch us go top of the table for the second time in a month. It was a great day to be a Gooner! So, New York City was a blast, as per usual. Next stop on the tour - North Carolina and the Triangle Gooners! Look out for the Meet The Gooner Family feature on another influential Gooner, Kurtis Powers, coming soon!